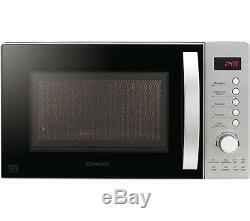 KENWOOD K20MSS15 Solo Microwave Stainless Steel 800 W 20 litres 8 Auto Programs. Small Appliances > Microwaves > Standard microwaves. With 800W of power and eight auto cook programs, the Kenwood K20MSS15 Solo Microwave delivers convenient and efficient cooking at the touch of a button. Heat, reheat and defrost a range of meals in no time at all. With the K20MSS15 you can choose between eight auto cook programs dedicated to different types of food including fish, meat, vegetables and pasta. The clear LED display and button and dial buttons are easy to use, with versatile cooking at your fingertips. What's more, the microwave's large 20 litre capacity ensures there's plenty of space for heating up your favourite casserole or defrosting a whole pizza. Liven up your microwave cooking with our range of microwave-safe accessories. Whether you need to warm up your soup for lunch or steam rice and vegetables for dinner, you'll find something to help you create exciting meals in your microwave. Whatever's on the menu enjoy stylish, convenient cooking with the Kenwood K20MSS15 Solo Microwave in stainless steel. All Currys/PC World Outlet guarantees are non-transferable. Maximum microwave power: 800 W.
Auto cooking programs: 8 auto cook programs including:, Reheat, Vegetable, Fish, Meat, Pasta, Potato, Pizza, Soup. Auto defrost programs: 2 auto defrost programs. Number of power levels: 5. Control panel: Push buttons & dial. Maximum countdown on timer: 95 minutes. Door hinge location: Hinged on left. Box contents: Kenwood K20MSS15 Solo Microwave, Glass turntable, Instruction manual. Internal dimensions: 208 x 306 x 304 mm (H x W x D). External dimensions: 254 x 440 x 358 mm (H x W x D). Boxed dimensions: 291 x 488 x 380 mm (H x W x D). Boxed weight: 11.9 kg. This product has no reviews yet, however see what our buyers say about our other products..
We do not accept orders to PO Box addresses and International orders, including those from the Republic of Ireland, the Scottish Highlands and the Channel Islands. Orders for large domestic appliances are accepted to all mainland UK addresses (including Northern Ireland) and the following islands: Isle of Skye, Isle of Sheppey, Anglesey, the Isle of Wight, and the Isle of Man. This excludes the Channel Islands and BFPO. To create your return label. Unopened - in an as new condition - unused, without installation or data input - in the same condition as supplied to you - complete with any accessories and free gifts offered with it - with the original box and unopened packaging. Unwanted products cannot be accepted after 30 days if any of the above criteria are not met. The right of cancellation does not apply in the following circumstances. Failure to obtain this may prevent us from refunding you if your return is not received by us. Your return can be tracked using the tracking reference from your proof of return receipt by clicking Track My Return. In the same condition as supplied to you - complete with any accessories and free gifts offered with it - if possible, with the original box and packaging. The above warranties do not cover non-faulty products, nor issues caused by accident, neglect, misuse or normal wear and tear. Please note - we do not stock spare parts, and are unable to send replacement parts. You received an incorrect item - you received a damaged item - you received a faulty item. Can a Currys or PC World retail store help? Reassuring 12 month guarantee on all products. The item "KENWOOD K20MSS15 Solo Microwave Stainless Steel 800 W 20 litres 8 Auto Programs" is in sale since Friday, May 20, 2016. This item is in the category "Home, Furniture & DIY\Appliances\Small Kitchen Appliances\Microwaves". The seller is "currys_pcworld" and is located in Newark. This item can be shipped to United Kingdom.